On your Wedding Day we are just as excited as you are! From our first meeting to numerous site visits, phone calls, and emails your vision begins to grow. On June 4, 2017 DJ Pasha Entertainment had the pleasure of providing Full Service Coordination, complete sound for the ceremony, cocktails, and reception, along with Master of Ceremonies and Sound Engineer- DJ Pasha. Our couple Tommy and Leigh An wanted everyone invited to feel included and have fun. Our Lead Coordinator Teresa went over their guest list by family members and ages. With this knowledge we created a floor plan for both the ceremony and reception so that all guest could see and hear all of the special moments and so older guest would not be seated to close to the projected sound. DJ Pasha worked closely with the couple on all of the particular dances, music requests, and vibes that would fill their beautiful wedding day. We want to represent our couple and welcome every guest through music and clear announcements. Day of the Wedding was perfect as planned. Our Bride and Groom were relaxed and excited to get to their party! So relaxed our Groom wrote a song for his new Bride just days before their wedding and wanted to perform it live. We fit this performance into the timeline, along with amplification and the surprise turned into a mini concert. For over 15 years DJ Pasha Entertainment has been the soundtrack to the incredible 4th of July Fireworks Celebration at the Santa Monica Beach Club. With every year as the 4th of July weekend approaches guest count and excitement grows. With a day full of activities, a volleyball tournament, and reservations reaching close to 2500 people DJ Pasha Entertainment was asked to fill the day with music. The original Beach Club DJ and MC Pasha was assigned to the event. With his popularity and knowledge of the Club it was a perfect match. We also included our in house Band to increase the family festival vibes. DJ Pasha took to his booth at 5pm and started beach vibes as guests danced, watched the volleyball games, and claimed their spots on the beach for a wild night. Our 5 piece band took to the stage at 6pm playing everything from Motown to current Pop. Guests were able to dance and sing along with their children as the band jammed all of their favorite songs. As the sun went down DJ Pasha rocked in between the band’s breaks and the energy grew with every shade of night. The band’s last set was pure high energy with a packed dance floor. The fireworks are shot from the property’s tennis courts, so DJ Pasha helped to direct guests to safe areas. As final preparations were made to light up the sky, DJ Pasha handed out glow items and DPE foam sticks making a sea of flashing colors. 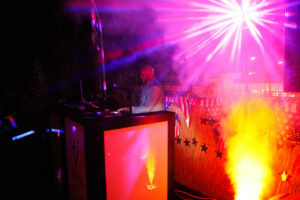 The countdown was on and in sync with the fireworks show, DJ Pasha performed a holiday mix of pure American patriotism. With an explosive 18 minute fireworks show, the crowd knew what was next. It was the DJ Pasha show, as he hit the lights, lasers, and fog cannons the entire beach took to the dance floor and sand to groove the night away. With the skybar packed with dancing party people and no one wanting to go home, DJ Pasha rocked until 2am. The 4th of July beach party is the biggest yearly event at the Beach Club. It is an honor for us to be a big part of America’s birthday and give every person in attendance the party they wait for all year! Go backstage and experience what it feels like to party with us. 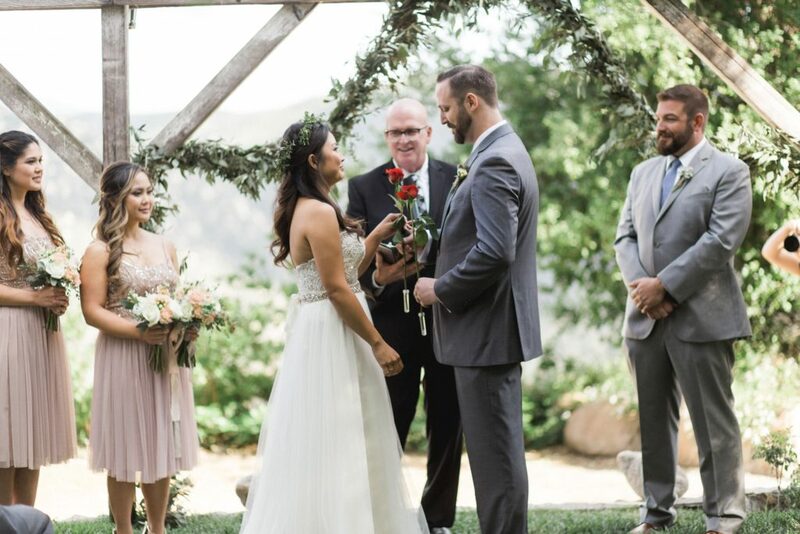 On a beautiful and sunny June day the Wedding Experts of DJ Pasha Entertainment Coordinated and Planned the rustic Wedding of Madeline and John. From the first meeting with our couple, our Lead Coordinator Teresa, and MC/DJ Pasha there was an instant connection. After 2 hours of planning and going over suggestions but mainly laughs, we all couldn’t wait for the wedding date! Teresa worked closely on bringing our couple’s visions to life. From Coordinating and directing a fun Wedding Rehearsal to planning and executing a stress free timeline. DJ Pasha had the pleasure of getting to know the couple, their family, and friends through music. With the DJ Pasha Entertainment Event Forms on our website couples are taken by the hand to begin forming their custom musical timeline for their day. The submit forms include details such as likes/dislikes, introductions, toastees, special dances, and music that represents our couple’s styles. We know how important it is to have coordination and music work together seamlessly. Every action needs to be coordinated while every moment to music. With vendor communication and our close relationship with the venue our Wedding Team was built for Madeline and John. Meeting and equipment coordination set us all up to give our couple a successful Wedding Party. The Ceremony was timed perfectly by Teresa and her assistant. With the help of DJ Pasha and Elizabeth Burgi Photography we organized to have the wedding party and all of the guests take some amazing group photos on the ceremony site. That excitement kicked into a cocktail hour full of delicious appetizers, up beat music from DJ Pasha, drinks, and XL Cocktail Games. Our Bride and Groom wanted to join the cocktail party so bad we broke them in with Calvin Harris’ “Feel So Close” and everyone welcomed them to their party. Every toast, every special dance, and cake cutting where all on time and every guest felt included. With our Coordination and announcements we make certain every guest knows what is happening through out the day and night while checking in on the comfort of our couple. Once we opened up the dance floor no one ever left! The couple had some must haves and guests definitely had requests but Madeline and John really wanted to let DJ Pasha do his thing. And that he did! By watching the dance floor and our couple every song brought screams and cheers out of the crowd. See our work in action from the visionary styling from TSI Video Productions. Our hearts melt seeing all of the details and work to bring our couple’s wishes come to life. We are proud to have the opportunity to create memories of love that will last forever. With the DJ Pasha Entertainment Summer Wedding Tour in full swing, we want to look back a couple months to the Wedding of Lauren and Mike. 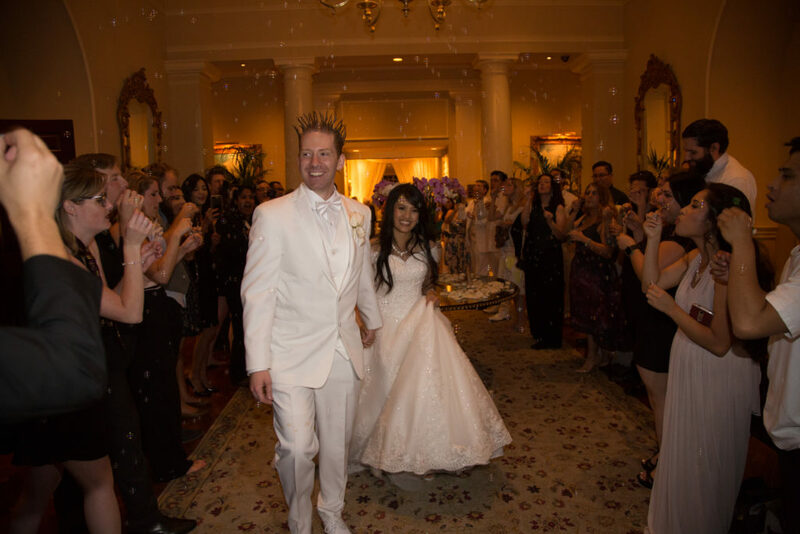 The gorgeous Wedding Ceremony and Reception took place at Westlake Village Inn. With each walk through and meeting we had excitement grew, mostly about the music. Aside from all of the planning and particulars, we let couples know we are the fun part. For us the best way we get to know our couples is through music. Our couples individual styles, their love story, family, and friends will all play a big factor into their day’s mix. With our helpful forms on our website, we surround all of the day’s timeline around music. We take immense pride in being the one element that guests will hear from the first moment they arrive to the very last dance. Our Groom Mike, had allot of friends from college and loved old school hip hop. Our Bride Lauren and her family, especially her Dad, raised her on music. The selected performer for the evening was DJ Pasha. He too was raised off of music so they both had much in common. Together our couple and DJ Pasha went even further than just a music list, with many meetings the three of them created the perfect custom mix. Our Bride also wanted to share her music with their guests in a very special Father and Daughter Dance in a mash up performance. The Father/Daughter mix was to be a representation of songs they both love and have grown together with. Lauren picked 13 songs from Rick James, to Guns N Roses, to the Temptations. DJ Pasha worked with her on the edits and created a perfect blend for Lauren and her Dad to practice. On their wedding day guests were treated to a Classic Rock Cocktail Hour, an elegant dinner mix with classics from the 50’s to today pleasing guests of all ages. When the time came for the Father and Daughter Dance, no guest had any idea of what they were in for. DJ Pasha hit the mix which started with a slow song, then the energy kicked in with every song. We could tell just how much fun Lauren and her Father were having as well and the screams and cheers from all of the guests. The performance was a smash and really showed everyone how much fun they are going to have with DJ Pasha. The dance floor was always packed as DJ Pasha mixed every song on their list as well as requests. By getting to know our couple’s likes/dislikes and their guest list we are confident in every song we play to be the exact representation of our couple. We don’t believe in standard “wedding music” we believe in who you are and no wedding is ever the same. We become you and one of the most important aspects you and your guests will remember the most. Take a look at DJ Pasha in action in this clip from www.artonfilmmedia.com. We will see you on the dance floor! For the last 5 Years DJ Pasha Entertainment has worked with the Temecula Valley Balloon and Wine Festival. We have supplied our top DJs to add energy through out the festival’s day and in between acts. In 2016 DJ Pasha and the promoters felt the festival needed something more. DJ Pasha’s concept was a festival After Party which would allow guests to have a complete day and night. After the main stage act guests would make their way toward the Wine Stage and dance the night away. This After Party would also be a safety precaution so that the over 20,000 guests are not all leaving the parking areas at once. In 2016, immediately after the World Famous Balloon Glow the Wine Stage exploded with energy! Night one featured DJ Pasha and night 2 DJ Orion. The After Party was an amazing success with an overwhelming demand for DJ Pasha Entertainment to return in 2017. The 2017 Temecula Valley Balloon and Wine Festival was to be the biggest yet! With a themed 80’s Party Live Friday Night, a 90’s Rock night featuring Bush Saturday, and some of Country’s biggest stars Sunday. With the After Party’s success, 2017 also marked the return of DJ Pasha and DJ Orion. The festival promoters realized the popularity of these 2 men and made adjustments to enlarge the stage and enhance the sound and lighting to accommodate the thousands coming to party. DJ Pasha Entertainment took it even further with added dancers, fog cannons, and a lighting and effects show that could be seen from an airplane. DJ Pasha kicked off opening night on the Main Stage with a wicked 80’s mash up mix to get the sold out crowd pumped to see their favorite bands. Then it was off to the Wine Stage for final preparations for the biggest TVBWF After Party yet. With so many guests dancing and having the time of their lives, on both nights the stage managers had no choice but to let DJ Pasha and DJ Orion keep rocking as late permit possible. From news coverage to blogs to the ticket holder’s experience the DJ Pasha Entertainment After Party was the talk of the festival. We hope to see you all in 2018 as we are proud of what we created! In the setting of the Secluded Gardens an oasis high in the Temecula Wine Valley mountains DJ Pasha Entertainment was proud to be the Entertainment choice for Cherise and Mike’s Wedding. After multiple meetings, conversations, and venue visits all was in place for a rocking fairy tale wedding! DJ Pasha was the day’s Master of Ceremonies and DJ. We supplied full sound set ups for 3 seperate areas at the Garden’s very large property for seemless transitions. Cherise and Mike’s playlist filled the day with a mix by DJ Pasha that represented their relationship and their guest list. At guest arrival, family and friends were treated to instrumentals of popular songs as the ceremony overlooked the wine valley. We provided wireless microphones for the officiant, our couple’s vows, and readings. The personalized vows were heard crystal clear throughout the ceremony area. After being pronounced Husband and Wife, guest were invited down a trail that lead to a gorgeous cocktail hour. DJ Pasha continued sharing the couples vibes playing artists such as Sublime, 311, and Iration creating a cool reggae festival vibe. Much like where our couple met. Once the reception area was ready DJ Pasha invited our couple’s family and friends to the reception part of the evening. With the exciting Grand Entrance directly into their first dance, Cherise and Mike were overjoyed with their Wedding Day. DJ Pasha Entertainment supplied a large enough sound set up to cover the 300 guest outdoors dining and reception area. With DJ Pasha maintaining the timeline and making clear announcements every guest felt involved and a part of the celebration. It is very important to us to have everyone’s attention and to respect the toastees and particular dances. Even with every song DJ Pasha played during dinner, guests were getting excited to dance. With DJ Pasha representing our couple’s music and playing to our couple’s guest for hours already, the versatility and custom music selections made everyone feel our couple’s style. We do not believe in typical “Wedding Music” or fillers, every song needs to engage the oldest to the youngest. Once DJ Pasha invited all of the guests to join our Bride and Groom on the dance floor, no one ever left. With tracks from Blackstreet, 2pac, Incubus, to Motown DJ Pasha monitored the dance floor to make sure every guest was pleased. DJ Pasha Entertainment has been the in house entertainment provider at the Santa Monica Beach Club for over 18 years. And more then ever, with such a family bond with the Club and it’s members DJ Pasha Entertainment is dedicated and requested to supply the highest quality performers. With the Club being a landmark for decades, we want to offer even more excitement every year making events feel brand new. The Memorial Day Family Beach Party hosts over 500 party people. This year was a Luau theme, our very own DJ Pasha was booked for a 5 hour high energy set. We also booked an adorable Moana character to entertain the kids and photo opportunities. With 2 days before the big Luau, we were notified that the booked Luau show and dancers cancelled. With that, we immediately got to work and reached out to our team of professionals. In a matter of hours DJ Pasha Entertainment organized a beautiful interactive Polynesian dance show with instructional dances that had all of the members involved on the dance floor. As the sun set, the Beach Club Luau resembled a vacation in Maui. As the Grand Finale our talented Fire Dancers put on a wild heart pounding show that kept all of the guests in awe. We then brought our dancers back out and had every member up on their feet dancing together! With a packed dance floor DJ Pasha then transitioned into a Night Club vibe and all danced the night away! Owner and President DJ Pasha has begun inviting his clients and fans to share his headphones with the release of DJ Pasha’s Playlist Episode 1 in 2015. DJ Pasha’s vision is to let potential clients hear his voice on the microphone and share new music and artists from around the world. With radio being so repetitious and commercialized, DJ Pasha is introducing new artists and remixes direct from his programming. To find a website for his concept took a while but he found a home for his music on Mixcloud.com/DjPashaEntertainment. Since 2015 DJ Pasha has released multiple Playlist Episodes and has built his Mixcloud page even larger with live and studio full mixes. Each of these mixes have a theme and story to take his listeners on a musical journey. With a strong passion for music, DJ Pasha daily researches sounds to perfect his mixes at events. By playing fresh and worldly tracks in his sets, DJ Pasha opens the ears of party attendees to brand new rhythms. Frequently asked what he is playing and who the artists are; DJ Pasha is now offering a new style of radio. As the owner and most active performer of DJ Pasha Entertainment he believes showing clients how he sounds, mixes, and projects as an event’s master of ceremonies and DJ. By following DJ Pasha Entertainment on Mixcloud you will automatically be notified when DJ Pasha has a new release! Enjoy the party that never dies.